NBC’s freshman comedy sensation “Community” is ending its first season on a high note: Entertainment Weekly made the show’s season finale tonight Number 1 on its Top Ten “Must List” of things to do this week. And it singled out co-stars Joel McHale and Gillian Jacobs for the developments in their characters. So how lucky am I to welcome Community beauty Gillian to Mr. Media today? 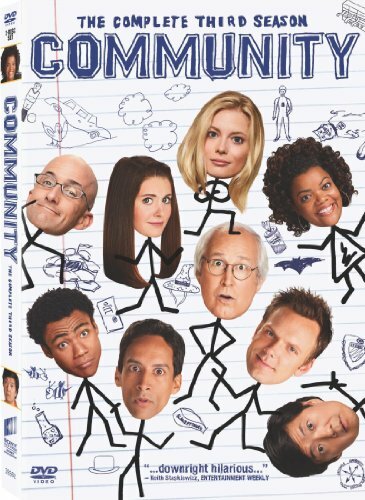 Order ‘Community: The Complete Third Season’ starring Gillian Jacobs, available from Amazon.com by clicking on the DVD cover above! Gillian’s character, “Britta,” has grown as “Community” itself blossomed this season. When the show debuted, she seemed destined to be a one-noter whose sole purpose seemed to be swatting down blatant advances by McHale’s womanizing character Jeff. But as the weeks went on, the writers found better, smarter ways of putting her to work, expanding Britta into as fully formed a person as everyone around her-including the more evolved Jeff. Regular listeners know I’m a fan of “Community,” which is why Gillian is the fifth star of the show invited to join me on Mr. Media.